Tadelesh Bekele crossing the finishing line. 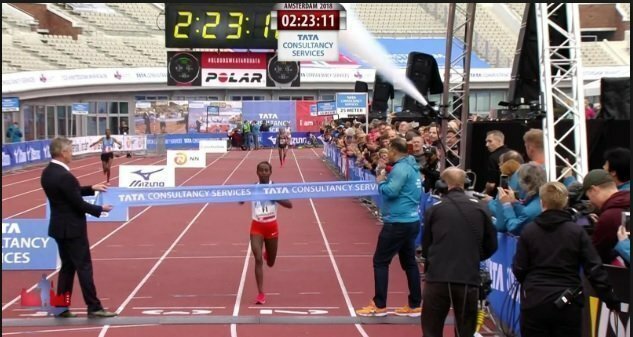 Tadelech Bekele won Amsterda marathon this morning; it took her 2:23:07 to cross the finishing line. This is her second win a row. Shasho Insemu and Azmera Gebru finished second and third in a time of 2:23:13 and 2:23:31. In the men’s race, Kenya’s Lawrence Cherono won the marathon breaking his own record by more than a minute and defending his last year’s win. He finished in 2:04:05. He was 33 seconds ahead of Ethiopian runner Mule Wasihun who finished in 2:04:37. Another Ethiopian runner, Solomon Deksisa finished third in 2:04:40. Kenenisa Bekele dropped out of the race. Meseret Defar made her debuts was not successful either.